A view of the dust around the young star HD 135344B (orange), as well as the gaseous material (blue). A new study suggests that the smaller hole in the inner gas is a telltale sign of the presence of a young planet clearing the disc. A high-definition view of planetary nurseries around four young stars has revealed a new solution to a puzzling mystery: why a hole appears in the middle of some of those nurseries. Young planets are believed to form from large discs of gas and dust found around stars, sort of the way a rolling snowball can form an entire snowman from a flat field of snow. But observations of some planet-forming discs show missing material close to the star: a gap in the dust, which looks like a hole in the middle of the disc. The planetary discs that have dust gaps are known as transitional discs. In the four transitional discs in the new study, the scientist were able to make observations in higher detail than previous studies could provide. The high-res views also revealed gaps in the gas around the stars, a detail not visible with previous observations. However, the gas gaps were smaller than the dust gaps, meaning some gas was still present inside the dust gap. The finding of the smaller gas gap "could only be explained by the scenario in which newly formed, massive planets have cleared the gas as they traveled around their orbits, but trapped the dust particles further out," the statement said. Nienke Van der Marel, who led the new research while earning her doctorate at the Leiden Observatory in the Netherlands, said the detailed images proved by ALMA could "rule out" the explanation that stellar winds created the dust gaps. "The deep gap points clearly to the presence of planets with several times the mass of Jupiter, creating these caverns as they sweep through the disc," van der Marel said in the statement. It's possible that these dust gaps can therefore be used to identify the presence of planets around a distant star, the study authors said. "All the transitional discs studied so far that have large dust cavities also have gas cavities. So, with ALMA, we can now find out where and when giant planets are being born in these discs, and compare these results with planet formation models," Ewine van Dishoeck, a researcher at Leiden University and the Max Planck Institute for Extraterrestrial Physics in Garching, Germany, and one of the paper authors, said in the statement. This schematic diagram shows how the dust (brown) and gas (blue) is distributed around the star, and how a young planet is clearing the central gap. Astronomers using the Atacama Large Millimeter/submillimeter Array (ALMA) say new observations suggest that planets with masses several times that of Jupiter have recently formed in these discs. ALMA is an array of 66 antennas in the Atacama Desert in Chile. The new finding was performed while the observatory was under construction, with only a fraction of the antennas in use. Astronomers said they hope to get a second look at these star systems using the full power of the array. 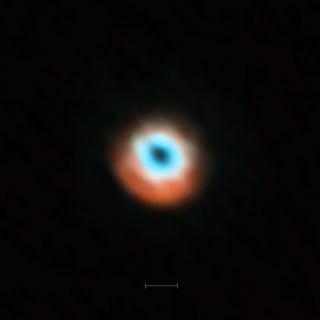 The four planetary systems examined were SR 21, HD 135344B (also known as SAO 206462), DoAr 44 and Oph IRS 48.